AgResource maintains a strategy of selling summer weather-driven rallies in the next several months, as the structure of the world grain market remains one of oversupply. It’s almost that rallies look to be short-lived in spite of weather issues. 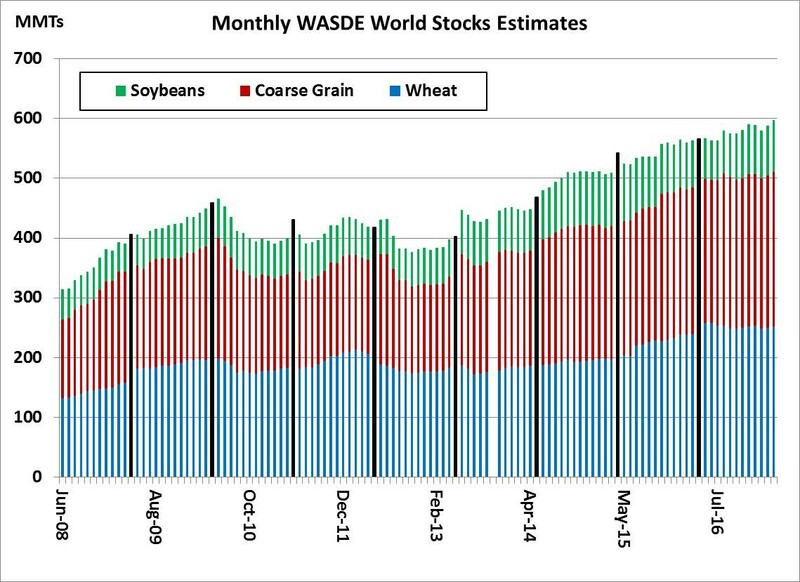 The graphic above charts the USDA’s world wheat, coarse grain and soybean stocks by month since 2008, and the trend since 2013 has been higher world inventories in almost every monthly WASDE release. In fact, the USDA’s April WASDE featured the highest combined stocks estimate on record at 598 million tons, up 10 million from March and up 34 million from its April WASDE in 2016. As such, world cash grain markets – perhaps the best indicator of the entire world’s perception of supply and demand – continue to weaken, and are even weaker in forward months. The graphic above displays US, Black Sea and Argentine corn premiums at export markets for spot delivery and into August. 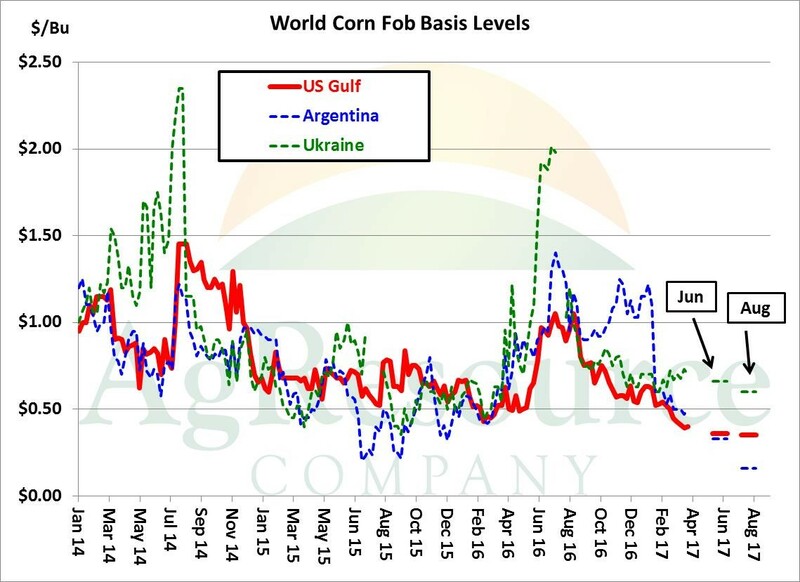 Argentine basis is testing all-time lows and may weaken further in Jun/Jul, after the Argentine crop is harvested. 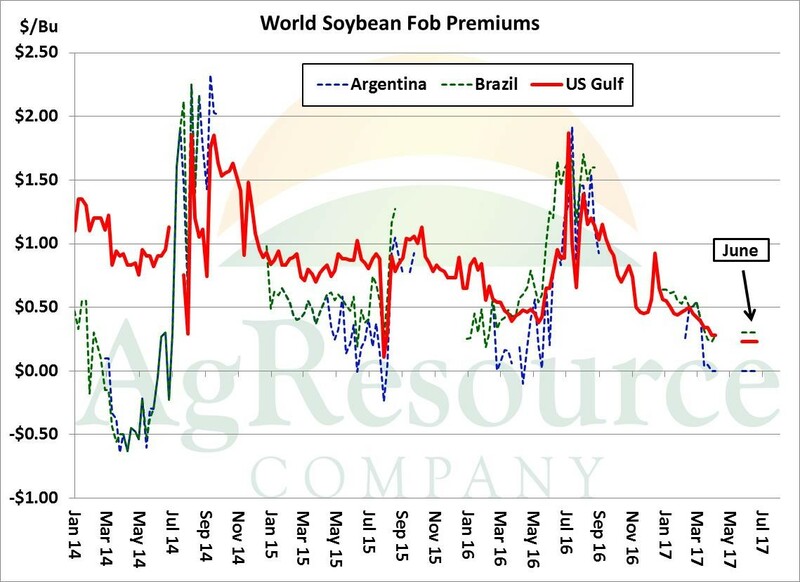 World soybean premiums displays a similar phenomenon. Gulf basis for delivery in May-June is at near record lows, and basis in Argentina is at even money with CME futures. The point is that the April WASDE was yet another that suggests competition for world grain & soybean demand is rising, not falling, and this should be kept in mind as Northern Hemisphere weather conditions are debated in the months ahead.